Dawn Matonis was born in Bayshore, Long Island, but grew up in NH. She moved, lived and went to Flagstaff, AZ, where she earned a Bachelors degree in Secondary Art Education with an endorsement in Elementary Art Education at Northern Arizona University. She moved to Florida to re-unite with her family who migrated to the south while she lived out west. Matonis' favorite subject in school was Art, and she always knew she wanted to be a teacher ever since she was in high school. Her Art teacher and Art classes are what kept her in school. She hopes to do the same for her students. Matonis has been teaching at Lemon Bay High for the past 20 years. 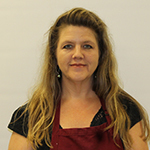 She is our Fine Arts instructor who teaches 3-D Art/ Ceramics I, II, III Honors, Portfolio and 3D AP Art classes. She's the sponsor of the Lemon Bay HS Art Club and is the Program Planner for the Fine and Performing Arts program. Matonis loves being here at Lemon Bay and said, "We have great students, a great community and a terrific staff!" She believes that her students bring out the best in her when she's teaching. When she's not teaching, she enjoys working on her own personal artwork, researching new art challenges for her students, tending to her many gardens, entertaining her very active dog, traveling to exotic places and of course spending time with family. If she could have one wish she would want to, "lose weight by eating ice cream and cookies, and then world peace. "Although slightly eccentric and prone to break out into song, this wacky teacher is loved by all.